Rhonda Vincent and the Rage in performance at Roanoke Island Festival Park Indoor Theatre. The Queen came to town on Friday evening and she left little doubt about why she is royalty. The queen in this case was Rhonda Vincent sometimes called the Queen of Bluegrass because she has won so many awards in that style of music, honestly—after hearing what she and her band, The Rage, did with music, limiting her to “bluegrass” is wrong. Entitled “An Intimate Evening with Rhonda Vincent,” she brought her show to the Indoor Theatre at Roanoke Island Festival Park. Usually playing to festival crowds and audiences numbering in the thousands, Vincent seemed to relish performing before an audience of at the most 200. The song selection she and the Rage performed Friday night was far broader in scope than she usually plays. There was, of course, a lot of bluegrass and some gospel—that is the genre she grew up, performing but there were some also a couple of surprises. Her arrangement of Poco’s hit Crazy Love was original, taking full advantage of the skills of the Rage’s musicians, yet still true to the original. Everyone in the band got to take a lot of solos, and in an evening where everyone stood out, Brent Burke on dobro was creating a new way to think of the instrument—venturing at one point into what sounded like jazz. Along with some great music the evening was also filled with a lot of humor—probably because it was so relaxing. A great show brought to the Outer Banks by Corey Hemilright’s Bluegrass Island. 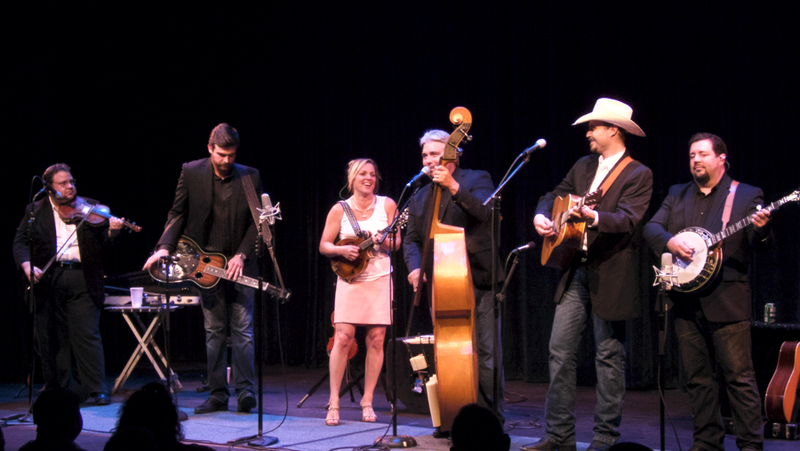 Rhonda Vincent and the Rage will be back in September for the Outer Banks Bluegrass Festival.